Now more than ever we eaters—that’s all of us—must stay attuned to what is happening to our food in the United States and around the world. Closely connected to our environmental fate, evolving technologies, labor rights, physical and mental health, food has the ability to both heal and to harm, to feed and to deprive, and we must be savvy consumers. Whether you have a minute, an hour, or a lifetime to devote to understanding what we eat and where it comes from, take a moment to chew on these great resources. From podcasts to action networks, to monthly webinars, there are a number of ways to stay food-informed on any schedule. You can check out 56 food-centric TED Talks, on the TED website or most mobile devices. Hear from LA-based guerilla gardener Ron Finley, a biologist creating kombucha clothing, and a chef sourcing ethical foi gras. Each memorable morsel will have you salivating to learn more. Subscribe to The Racist Sandwich, a Portland-based Food Justice podcast with a taste for challenging “exotic” and “ethnic” labels placed on world cuisine. The hosts interview chefs, writers, artists, and even comedians for their takes on how we can approach food and people with equity, respect, and good taste. Scroll the NPR Food feed for excellent short reads on food culture, policy, health and the environment. NPR highlights important developments in technology and farming, and celebrates flavors from around the world. As a bonus, they also post occasional recipes with their stories. Join the conversation at one of Slow Food USA’s monthly webinars featuring speakers from all across the food movement, offering free talks and Q&A’s about their work in the field. Stay tuned in to Inside School Food, a website and podcast with free streaming interviews that offer a window into K-12 food service. Host Laura Stanley speaks with food service professionals, nutritionists, non-profits, and other food professionals to offer a holistic view of school meals and what we can do to improve the recipe. The Farm Report is another great podcast where you can learn from leaders in the farm and food world. Supported by Heritage Radio Network, The Farm Report features hour-long conversations with industry professionals and entrepreneurs. Support food writers and subscribe to Civil Eats an excellent daily digest for satiating, long-form journalism. Civil Eats divides its content amongst Food Policy, Farming, Health, and the Environment with quality content on Farm to School and food politics. The Center for Food Safety is a national non-profit network that advocates for environmental and human health. CFS publishes articles on pesticides and food safety, actionable steps for creating sustainable food policy, and connects people to their local chapters for direct impact. Check out Hawai’i CFS for campaigns, updates, and information on getting involved. Join the National Farm to School Network to learn about how educators across the country are connecting communities with fresh, healthy and local food. Sign-up for the newsletter for news, stories, grant opportunities, and more. This book is a great entryway into learning about the systems and psychology that inform the story of processed foods and where we are today with health and diet. Funny, easy to digest, and informative, this book has helped me to make better decisions about what I purchase and how my body responds to what I eat. I like how the author parallels the rebuilding of traditional agriculture systems that feed us such as ʻauwai and loʻi with the growth of the Hawaiian Charter School Movement. 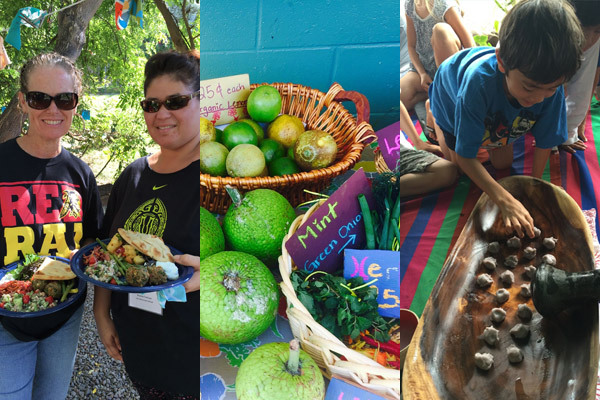 Hālau Kū Mana students share how they connect spiritually with the land and water of ʻAihualama in Mānoa, care for Hāloa, and apply ancestral agricultural knowledge in 21st century education. A classic book by Marion Nestle! This book explores the ways in which the food industry influences nutrition and health. It is an exposé on the flaws and consequences of the industrial food system, and it reveals how marketing and lobbying by the food industry affect both government policy and individuals' food choices. This version of Michael Pollan’s hit book was adapted for older children and teens (grades 7 and up), but adults will get a ton out of it as well. It’s a great choice for parents to read with their kids and will lead to many conversations around the table about where our food comes from. You can also check out Food Tank’s Winter 2017 Reading List for 17 highly nourishing reads with voices in permaculture design, food justice, agroforestry and more.